This blog post is sponsored by REI // REI has always been my favorite store to get outfitted for upcoming adventures, but I’m more proud than ever to be a Member of the REI Coop. 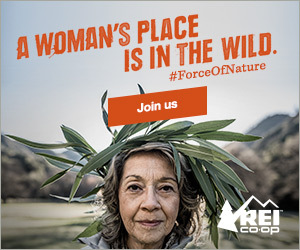 Over the last couple of years, REI has led the outdoor industry on some critical environment and social issues, from mobilizing strong support for our National Monuments to their #forceofnature campaign to put women front and center in the outdoors. Through their Force of Nature initiative, they have started a huge movement to make gear available to women of all shapes and sizes, offer new women’s specific classes, and bring a national spotlight to gender equality in the outdoors. I recently had the opportunity to speak at a local REI Force of Nature event in Salt Lake City about why it’s so important that more women have the opportunity, confidence, and skill set to become leaders in the outdoors. In this blog post, I share some of the stories and points I made during that speech and to challenge YOU to be a #ForceOfNature. This email nearly brought me to tears. The outdoor community is the last place that someone should feel like this. This woman needs the outdoors just as much as anyone else, maybe even more. Think about what it could do for her self-esteem, her health, and mind. Instead of feeling shunned, we should applaud people who are getting out of their comfort zone. I’ve talked in previous blog posts about my journey with the outdoors. I didn’t grow up camping and hiking. I’m an only child and didn’t have brothers and sisters to play outside with. My parent’s idea of the outdoors was eating outside on the patio (as long as there were no bugs), and the message I often got as a kid was “be careful” or “that’s dangerous.” I’m not knocking my upbringing by any means. My folks didn’t grow up doing outdoorsy things either, so they were simply looking out for me in the way they thought was best. Fast forward to my college years. I didn’t take very good care of myself and was pretty fearful of the outdoors. At age 22, I found myself about 30 pounds overweight. I absolutely hated the gym, and nothing I was doing seemed to have any impact on how I looked and felt. Then I went on my first backpacking trip and discovered the benefits of hiking. You mean I could lose weight, get healthy, and gain confidence by exercising somewhere pretty, rather than in a dark, stinky gym? I was sold. Twelve years later, I’ve gone through a lot of transformations. My body, my mind, my career, my community, my goals – and it all points back to my relationship with the outdoors. You know that saying, you don’t care about what you don’t know about? Before I started hiking, I didn’t know anything about public lands and was completely disengaged from the political process. The idea of preserving public land just for preservation’s sake doesn’t resonate with many folks who’ve never hiked or visited our national parks, monuments, and forests. What difference does it make if some parcel of land in the backcountry was drilled on or mined? They’ll never see it, they say, and there is no personal connection. They don’t see a reason to care. Alternatively, those talking points about how coal and oil extraction stimulate the economy and put money into our pockets, that’s something that might make more sense. Once I got a taste of what nature offers us, I started paying a lot more attention. A few years later, I decided to get a Masters in Environmental Management and ended up in DC where I worked to promote sustainable environmental policies. Right now, our public lands and environment are at a crossroads. Our national monuments are under review, the Antiquities Act is at risk, and funding for public lands is decreasing. What’s it going to take to win this battle? More outdoor enthusiasts. More people on the trails. More people visiting our national monuments. More people who respect nature for what it is, not for what we can remove from it. So going back to that email I mentioned at the beginning of this post. That woman needs the outdoor community as much as the outdoor community needs her. If we want to have a strong collective voice supporting preservation of our public lands, sustainable energy, and policies that look into the future, we need as many people as we can get. What is a true Force Of Nature? A true Force of Nature is a strong female. An all-inclusive female. Someone who doesn’t judge based on someone else’s abilities, looks, or background. Someone who speaks up for what they believe in, and follows through with action. If you know a woman who you think the outdoors can help, invite them to come out with you. Even if that means hiking an easier trail than you normally would. That one simple hike may just change her life and turn her into the biggest outdoor and environmental advocate you know – voting for pro-environment candidates, supporting effective environmental groups, and getting behind brands like REI that are fighting for our public lands. Those women, those Forces of Nature, are exactly the kind of women our country needs more of. So I challenge you to be that woman. Be a Force of Nature. For more information on REI’s Force of Nature initiative, head to their website. They’ve got lots of cool videos and inspiring stories to get you and your lady friends pumped up. What’s your definition of a Force of Nature? Share your thoughts in the comments! What i really like about your blog!? Honesty and interesting travel ideas. Thanks, love your posts! What exactly is the definition of inclusive?